Dr. K. Craig Place, who joined Grin Eye Care in 2015, brings 40 years of experience in private practice as a general ophthalmologist, where his first priority has always been compassionate patient care. 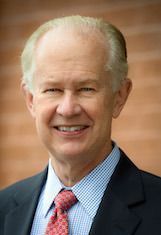 After receiving his bachelor’s degree in chemistry at the University of Illinois, Dr. Place earned his medical degree from the University of Kansas School of Medicine, and participated in residencies at St. Luke’s Hospital (general surgery) and the University of Missouri-Kansas City (ophthalmology) before establishing his practice and a lifelong commitment to the Kansas City area; he is also a Life Fellow of the American Academy of Ophthalmology. Dr. Place and his wife, Linna, have three children and truly enjoy taking long walks together, particularly on the beach in Michigan (where the summers can be a bit cooler). They also look forward to traveling in their free time—though Kansas City will always be home.